Hollywood films seem like the biggest advertisements for the United States of America. Action movies show muscled heroes saving cities like New York and Los Angeles from certain danger. Family dramas live in American suburbs, while romantic comedies maze through the downtown restaurants and bars. Westerns hearken back to frontier times and science fiction marvels at American space exploration. In addition to the best aspects of Americana, films also showcase the worst prejudices within American society as explored in two documentaries: Reel Injun (2009) and Reel Bad Arabs (2006). Reel Injun: On the Trail of the Hollywood Indian explored the portrayal of Native Americans in film. Reel Injun is illustrated with excerpts from classic and contemporary portrayals of Native people in Hollywood movies and interviews with filmmakers, actors and film historians. Reel Injun explores many stereotypes about Natives in film, from the Noble savage to the Drunken Indian. It profiles such figures as Iron Eyes Cody, an Italian American who reinvented himself as a Native American on screen. The film also explores Hollywood’s practice of using Italian Americans and American Jews to portray Indians in the movies and reveals how some Native American actors made jokes in their native tongue on screen when the director thought they were simply speaking gibberish. Reel Bad Arabs: How Hollywood Vilifies a People (which can be viewed online here) is an extension of the book of that name by Jack Shaheen which also analyzes how Hollywood corrupts or manipulates the image of Arabs. This documentary argues that the slander of Arabs in American filmmaking has existed since the early days of the silent cinema and is present in the biggest Hollywood blockbusters today. Jack Shaheen analyzes a long series of “demeaning” images of Arabs through his presentation of various scenes from different American movies which he has studied. He argues that this image is characterized by showing Arabs either as bandits or as a savage, nomadic race, or shows Arab women as shallow belly dancers serving evil, naïve, and greedy Arab sheiks. Most important is the image of the rifle in the hands of Arab “terrorists”. The film then attempt to explain the motivations behind these stereotypes about Arabs, and their development at key points in American history, as well as why it is so important today. Demeaning Native American and Middle Eastern movie depictions follows from Hollywood’s racist imagery of African and Asian decedents. Any race except White Europeans. Racist film portrayals parallel American depictions within sport and other cultural areas, like Halloween costumes. They reinforce one another and desensitize people to racism. Children receive this informal education early on. 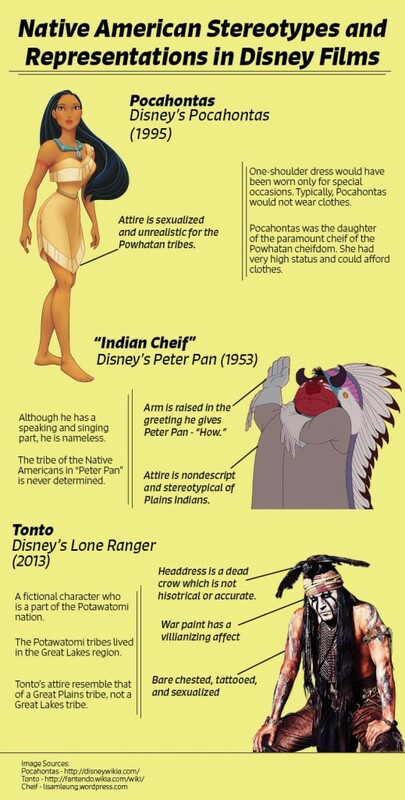 Disney has produced both Aladdin (1992) and Pocahontas (1995), embodying the worst aspects discussed above. One features an Arab land filled with genies and flying carpets. The other features a Native American women in need of a conquering European man’s help. These “family friendly” and racist films continue to be made today. It is important to reflect on this history as many Americans and Canadians will have limited to no interaction with the minority ethnic groups portrayed in film. This inability to experience counter-narratives leads many people to believe the reality depicted in film. It leads to ongoing violence against both groups, who are seen as supporting characters without true person-hood. Stereotypes to laugh at and not treat as fully human. Until we, as consumers and fans of film, realize our role in pushing such disgusting lies about peoples who have be mistreated by others for far too long, nothing will improve. We need to stop pretending that culturally inappropriate caricatures of people in film (and all media) are harmless or simply “good fun”. Stereotypes have serious consequences for everyone.